1,375 Artworks have been viewed 1,375 times. 1 Artwork has been added to favourites 1 time. Indiana artist Lucy Taggart was the daughter of Thomas Taggart, who fulfilled the political roles of mayor, boss of the state’s Democratic Party, and senator. Taggart graduated from the Classical School for Girls and attended the John Herron Art School before traveling to New York to study at the Art Students League and the Chase Art School. She also trained under the famous Philadelphia portraitist Cecilia Beaux. 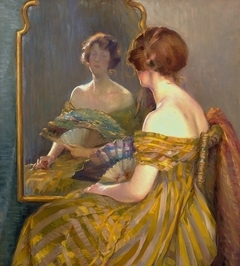 Taggart’s career as an artist began in 1905, and lasted until 1929. She was particularly known for her portraits, but she also painted landscapes and still lifes and created sculpture. From 1931-1943, Taggart taught painting at the John Herron Art School gratis.